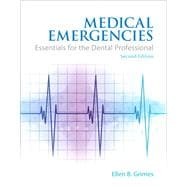 Updated for the latest knowledge and practice standards, MEDICAL EMERGENCIES: ESSENTIALS FOR THE DENTAL PROFESSIONAL, 2/ethoroughly discusses the essential elements of 30 different medical emergencies dental professionals may encounter, including etiology, signs, symptoms and treatment. It presents case scenarios and resolutions designed to promote critical thinking and problem solving; demonstrates the importance medical histories and vital signs in preventing emergencies; and guides students in developing appropriate medical emergency kits. Case Scenarios and Case Resolutions promote critical thinking skills Critical thinking is in the previous sentence, and easy-to-follow Treatment Flow Charts walk students visually through emergency procedures. Easy-to-use (Easy to follow was in the sentence before tables present the Signs & Symptoms of each emergency, and an At-A-Glance table summarizes the essentials of all emergencies. Student practice tests are now offered online, and extensive instructor support materials are available, including PowerPoint® presentations for each chapter.